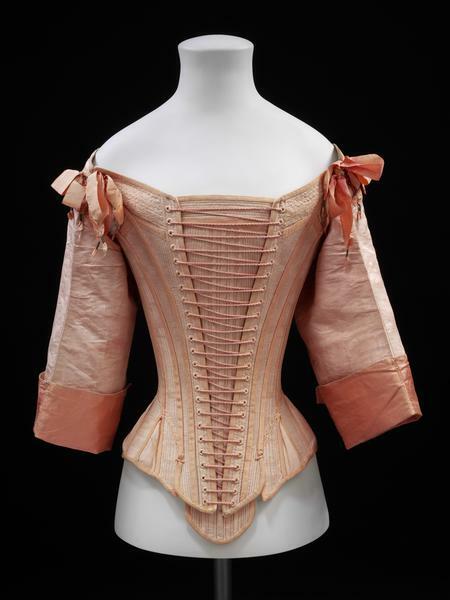 Stays (a stiff corset) were essential garments in the fashionable woman's wardrobe throughout the 17th century. Some sort of stiffening of a woman's gown had been part of dress construction since the early 16th century. Sometimes it was added to the outer bodice; sometimes it was in the form of separate stays worn under the gown. Originally the stiffening served the purpose of preventing the expensive and elaborately decorated fabric of the gown from wrinkling. However, because stays could mould the female torso, they became essential for producing whatever shape was considered fashionable. The stays are made by hand-stitching the watered silk to a layer of linen in long narrow pockets. Thin strips of whalebone are inserted into the pockets to give the stays their shape. Whalebone is in fact not bone, but cartilage from the mouth of the baleen whale. It grows in large sheets in the mouth of the whale and serves as a kind of sieve to filter out tiny krill, the whale's primary source of food, from the seawater. Commercial whaling began in the early 17th century in the North Sea and quickly spread to the waters around Greenland and eventually to the Bering Seas as the whales were hunted almost to extinction. Baleen was used for women's stays and hoops as well as a wide variety of other items such as riding crops, whips, brushes, chair backs and bottoms, carriage springs and fishing rods. Whale blubber was rendered into oil and used for lighting. Whalebone was the preferred stiffener for stays because it was firm enough to hold the shape, yet flexible enough not to break when the wearer moved. The ribbons retain their original points, the narrow metal clamps at the ends. They prevent the ribbon from unravelling and help to thread it through the lacing holes. The points are made of tinned iron; normally they would have rusted away. Front lacing stays and busk of pink watered silk, lined with linen and fully boned. All the outside edges of the stays are bound with pink silk grosgrain ribbon. 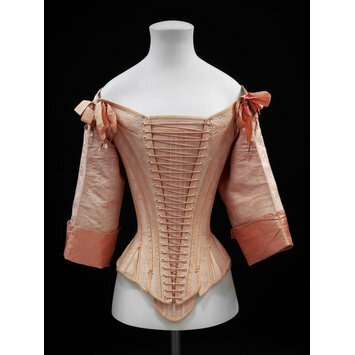 The sleeves are made separately and laced into the armholes with pink silk ribbons and points of tinned iron. There is a band of back-stitched embroidery at the neckline and armholes and a line of couched thread at the waist. The separate busk is boned vertically and horizontally, at the top, and completely bound with pink silk grosgrain ribbon. Given in 1959 by Miss C E Gallini, who attributed them to an Italian ancestor. No equivalent Italian examples or references have been found. There are images of very similar garments in Dutch genre scenes of the 1660s and 1670s, so these have been described as possibly Dutch. 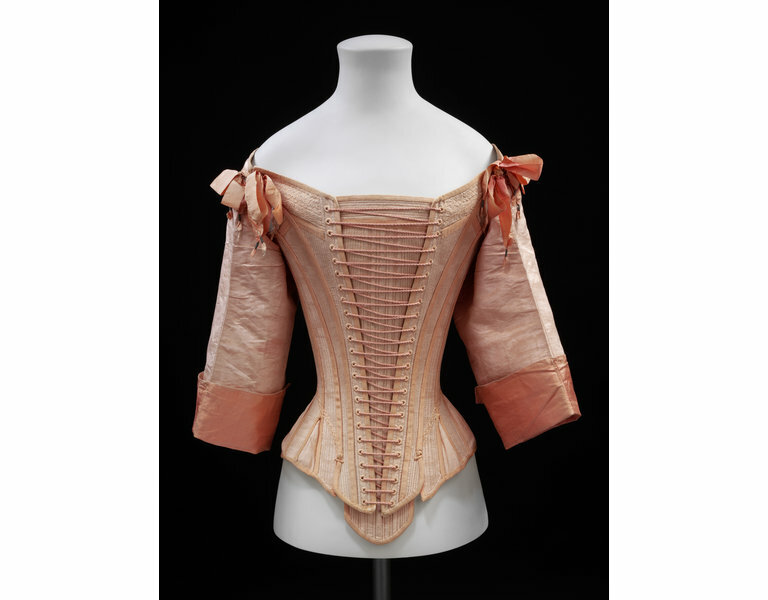 Stays from a transitional period in the 17th century, when the boned bodice was evolving from an outer garment to two separate items: unboned bodice and reinforced stays worn underneath. The luxurious fabric of these stays and the presence of sleeves suggests they might have been worn as outer as well as underclothing in an informal setting The back of the stays reaches as high as the shoulders and covers the very top of the arm. Both the front and back are flattened, creating the long, tubular torso fashionable for women in the 1660s.